Guru Jaya Rama Rao and Vanashree Rao are among the senior most artists of Kuchipudi. As artists empanelled in the ICCR, Jayarama Rao and Vanashree Rao have traveled widely performing in over 60 years. This is a pure dance Nritta demonstrating of the technique of Kuchipudi style. Swaras are musical notes and Jatis are rhythmic syllables. They are combined and virtually applied to a variety of steps and rhythmic variations. Composed by Yati Narayana Tirtha, this song is written in praise of Lord Shiva as an exception to his other Taranga geetams most of which address Lord Krishna. The song beautifully describes Shiva in all his splendor, with long matted locks and Ganga flowing from them, snakes adorning him, and ash smeared over him. The devotee envisions the Ananda Tandava of the Lord. This is choreography by Guru Jayarama Rao. This is an excerpt from the Bhagavadgeeta, Choreography by Jayarama Rao, with slokas selected from the Geeta. This depicts the scene before the war of Kurukshetra in Mahabharata, where Arjuna loses courage to fight his elders and relatives. Lord Krishna reminds him of his duty, and encourages him to fight the Kauravas, while revealing the Viswarupa. Tillana is usually performed at the conclusion at the conclusion of classical dance performance. Tillanas are traditional numbers set to a particular Raga. This is again a technical number demonstrating the virtuosity of the artists in performing vigorous sequences. Trained under the renowned Guru Vempati Chinna Satyam, Manju Barggavee portrayed the characters of Lord Venkateswara in padmavathi Srinivasa Kalyanam, Sri Krishna in Sri Krishna Oarijatham, Shiv in Harivilasam to name a few. She also featured in the movie Shankarabharanam to name a few. “Uttama Sahiti Murthy” and the “Rajyotsava” awarded have been conferred on Manju Barggavee by the Potti Sriramula Telugu University, Hyderabad and the Government of Karnataka respectively, she trains students in her Dance School “Natyaveda” – in Bangalore. Raddha feels betrayed when Krishna ignores her and enjoys himself in the company of the other Gopikas. Reminiscing over the time she has spent with her Lord, she laments. “Sweet notes pour out from his flute, as does nectar from his lips; his head sways and his earrings play with his checks. His head is crowned by a circle of peacock plumes which are caressed by the moonlight and the rainbow colours the cloth he is wearing on his dark body. I see his great arms embracing a thousand Gopikas and the rays from jewels banish the darkness of the night – my heart recollects him thus, seductively playing with me and mocking at me. This is a song from Yati Narayana Teertha’s Sri Krishna Leela Tarangini. The poet extols Lord Krishna as the one who protected the dwellers of Gokula from the Torrential rains by Indra which flooded Gokula, by holding the Govardhana hill as an umbrella. The divine pastimes of Krishna where he steals butter and also teaches the Gopikas that surrender is the ultimate form of Bhakti are depicted in this choreography of Dr. Vempati Chinna Satyam. Trained under Rukmini Devi Arundale at Kalakshetra, Ananda holds a Masters Degree in Archaeology and History, a M.Phil in Arts History (Development of Bharatanatyam Role of Kalakshetra), and a PhD in Tourism. She was conferred with the prestigious Padmashri, by Government of India – the title of Nritya Choodamani by Sri Krishna Gana Sabha, the Kalaimamani from the Government of Tail Nadu and Kalaratna by the Government of Andhra Pradesh. The devotee is wonder struck at Shiva’s dance. The sentiment evoked here is Adhbuta or wonder. Parvati, who is enthralled by Shiva’s dance, follows his every step with rapt attention. When Shiva dances, Brahma, the Creator leads the ensemble while the other Gods sing. In this Javali, the Nayika chides Krishna and says, “ Is this the time for love play O Lord”. My family rests within the house, the moon is shinning bring. What if those people coming this way see us together. O Srinivasa, is this fair ?”. Trained under Gurus Late Sri Dayal Sharan, and Dr. K. Uma Rama Rao, Dr. Alekkhya is a recipient of the Ugadi Visisht Puraskar and the Hamsa award from the Government of Andhra Pradesh. She teaches Kuchipudi as a faculty with the Department of Dance at the Potti Sri Ramula Telugu University, Hyderabad. Alekhya was awarded a Ph.D for her work on “Kshetrayya Padams and their importance in the Abhinaya aspects of Kuchipudi dance”. She also trains students at her institute Trishna in Hyderabad. This composition of Shyama Sastry is in praise of goddess Parvati eulogizing her as the divine mother of the universe. In this particular Javali the Nayika is aghast at being teased by her friends for being sympathetic to the hero. She complains that she had gone to the Nayaka’s house only to witness a procession of Lord Shiva and that she was being sullied for no fault of her’s. Nevertheless, she does admit in all subtlety that she did lose her balance when she saw him ! This is a composition of Sri Dayananda Saraswati in praise of Goddess Saraswati as the one who bestows knowledge and grace. It says she resides in the hearts of those who are pure and she is ‘Satva’ personified. The Goddess who enjoys music is worshipped by all the Gods, shine in her own light readily showers grace and is pleased easily. This is a composition of saint Annamacharya, where he wakes up Lord Krishna and extols him as the epitome of Sringara, Annamacharya says Krishna is the honey bee which always dwells in the lotus hearts of the gopis and he is the emperor of Rukmini and Satyabhama’s empire of love. He is the Lord Venkateswara, who grants unlimited boons to his devotees. Trained under Guru Sri Bhaghavathulu Sethuram, Pasumarthy Ramalingasastry and Dr. K. Uma Rama Rao, Siva Chandra holds a Masters degree in dance from the University of Hyderabad. A composition of Dayananda Saraswati choreographed by Sivachandra, where he praises Shiva, the Lord of dance, this particular choreography depicts the scene where Ravana prays for a glimpse of Shiva and Parvati, when they are blissfully engaged in celestial dance. On being denied of audience with him by Nandi, he starts to lift the Kailasa mountain itself. Siva simply presses his great toe on the mountain and Ravana is crushed underneath the Kailasa. A humble and repentant Ravana plays the Rudra Veena, making his intestines the strings. Ravana is ecstatic on Lord Shiva’s appearance. The poet Oothukadu Venkata Subbaya, extols the divine power and charm of Lord Krishna in this song. Choreographed by the artiste, he dance on the edges of the brass plate to the mnemonic syllables rhythmically woven into the song. Pagativesham (theatre performed in the day time), Veedhi Natakams (street plays), Saani Vari Bharatam (the female centric dance traditions of the temple dancers), Yakshaganam (yet another dramatic form), Bhagavatamelam (operatic dance based on religion, mostly Bhakti) and Stree Vesham (female impersonation). 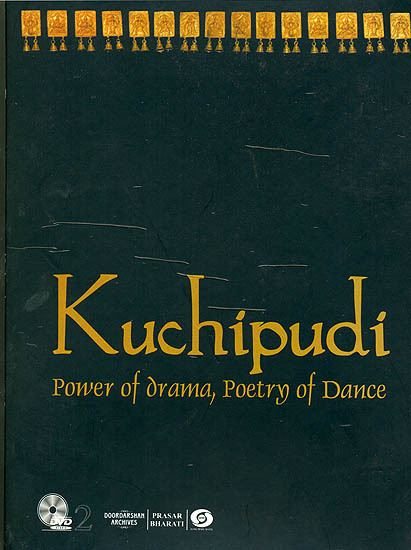 Kuchipudi in its nascent form was performed exclusively by men. The dance tradition is popularly believed to have been spread by Siddhendra yogi, an ascetic and followers of the Bhakti movement who gave expression to his religious sentiments through dance dramas, the most popular being the libretto of Bhama Kalapam. He thought this operatic form to a group of itinerant Brahmin boys who spread his message of Bhakti across the Andhra region. It is said that Abul Hasan Tana Shah, a Golkonda Nawab in the 17th century was so impressed by their performance hat he granted them a village, called Kusheelavapuram which later came to be known as Kuchipudi. The Bhagavatamelam dancers came to be known as Kuchipudi Bhagavatulu, and the dance from itself as Kuchipudi. Stree Vesham, the portrayal of female characters by young men was developed into a fine art by the Bhagavatulu. The proficiency of the Kuchipudi Bhagavatulu in their art and scriptures enabled them to portray with greater understanding the subtleties of feminine behaviour and honed their approach towards Manodharma or spontaneous improvisation. Kuchipudi has survived through ages and has gained prominence as a classical dance form of high standards because of its ability to adapt itself to the needs of the audience and of changing times. There came a stage where it was necessary to evolve a solo tradition from the larger drama traditions and female dancers were willingly encouraged. The technique of Kuchipudi then underwent changes to suit the feminine form. The dance form of Kuchipudi is a balanced amalgamation in Bharata’s Natya Shastra while retaining its dramatic origins, today’s solo dance are broadly characterized by ornate micro-movements, vivid mime, fast rhythms and fluid torso movements together creating a mood of controlled abandon. A characteristic movement that delineates Kuchipudi form other classical dance forms is that most Adavus or steps employ a stand and dip movements where the dancer tends to move towards and away from gravity. This imparts to the dance a sprightly energy that is typical of Kuchipudi. The repertoire of a Kuchipudi performance includes Naandi (invocation), followed by a Ranga Pooja or a prayer to the performing area, Jathiswarams, Sabdams, Kalapams, Padams, Javalis, Ashtapadis, Thillanas and Tarangams (where the dancer performs on the edges of a brace plate). The past 50 years have seen the transition of Kuchipudi from a predominant group tradition to a prevalent solo form and the emergence of accomplished female performers. This has brought about a change not only in the subtle adaptation of technique and presentation style, but also in the Aaharya and introduction of myriad themes, which are in tune with the contemporary social scenario. The ability of Kuchipudi to adapt, reinvent and accept changes while strongly retaining its traditions flavour has helped the dance from to reach out to a wider audience. it is possible to verify whether this DVD has regional coding? for play in the USA it must be either 'Region 0' [= no regional coding at all] or 'Region 1.' thank you!